Debugging introduction. Begin work on Assignment 4. 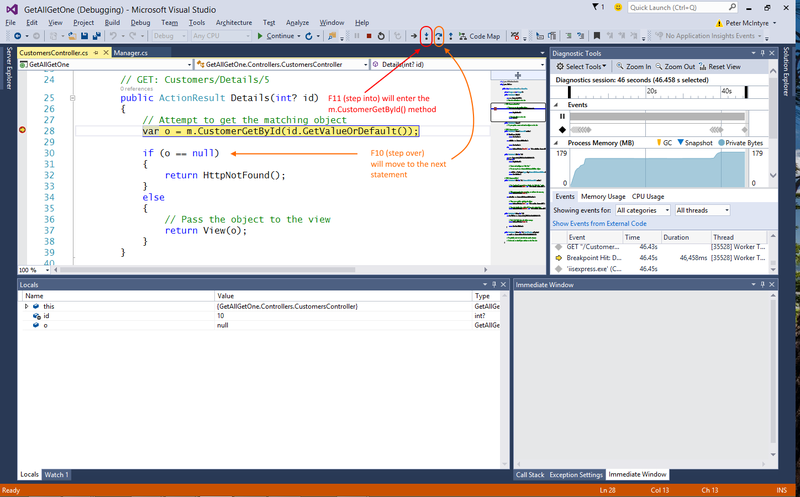 This section introduces students to the Visual Studio debugger. At this point, you have used Visual Studio for a few weeks, or for a few months or academic terms. It is likely that you have a little experience with coding errors, which appear when you do a build/compile. The “Error List” window/panel at the bottom of the editor area shows a list of errors and warnings. Did you know that you can simply double-click the error, and the code editor will open the source code file, and position the cursor at the point of the error? Or, did you know that you can right-click an error, and it will (among other tasks) enable you to get more detailed info about the error in another window or browser window? However, you likely also have a little experience with an app – e.g. an ASP.NET MVC web app – which DOES build/compile correctly and without errors, but it has a runtime error. 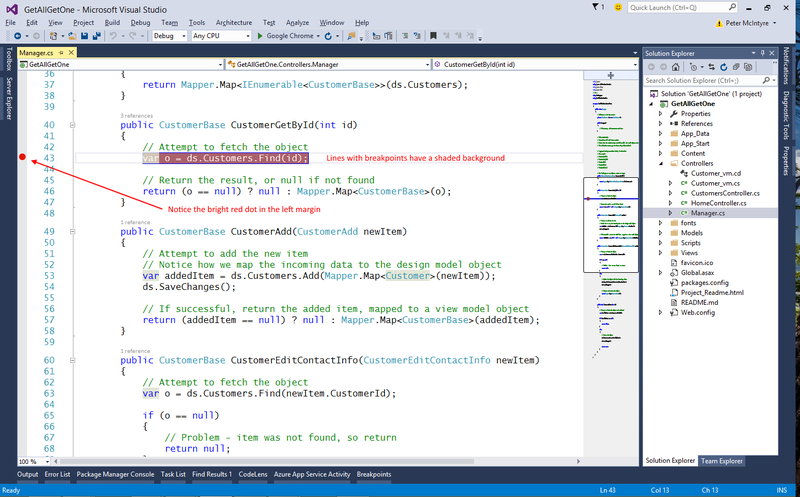 The Visual Studio debugger can help you fix these errors. It can also help you as you write code, and (for example) work through the code that implements a somewhat-complex algorithm or coding plan. Read the other sections if or when you want to learn more. There are several important concepts that you must know at the beginning of your debugging experience. A breakpoint is a line marker/indicator that will stop execution before the line of code is executed. In the code editor, it appears as a bright red dot. 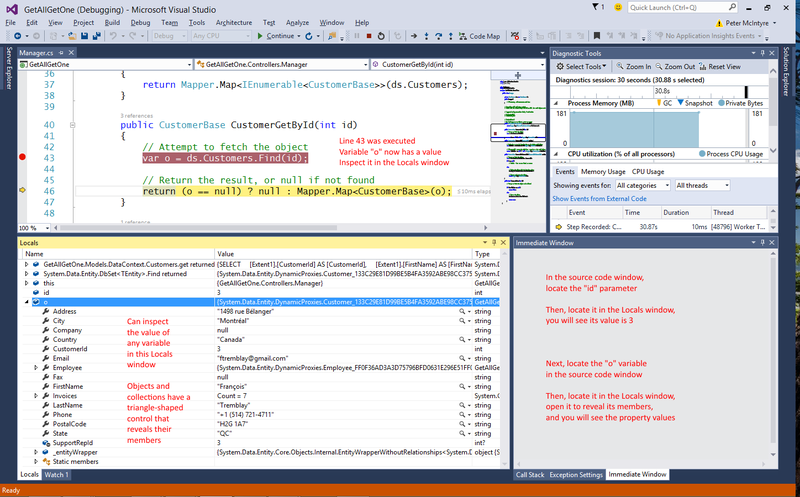 The following image shows a full-screen Visual Studio window, which has a breakpoint. Click to open the image full-size in a new tab/window. If you have many (many!) breakpoints, you can view a list of them, and manage them, in your “breakpoints” window/panel. On the Debug menu, choose Windows > Breakpoints. When you introduce new code, set a breakpoint at the beginning of the code block, and step through the code (described below) to make sure it is behaving as expected. If you have implemented a complicated behavior, set breakpoint(s) for the algorithmic code so you can inspect the values of the variables and data when the program breaks. In a Manager class, set a breakpoint when you are making changes in the data store. For example, the “add new” and “edit existing” use cases. This enables you to inspect, and compare, values in view model objects, with design model objects. In the past, you have used Ctrl+F5 to run your app. Now, to start the app with the debug environment, simply press F5. Use the app until it runs the code that has a breakpoint. 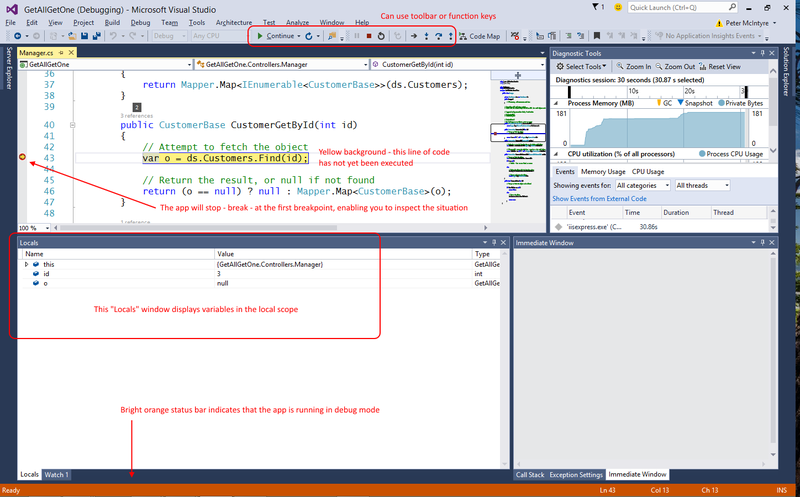 The Visual Studio window (usually) gets the foreground focus. Click to open the image full-size in a new tab/window. “Stepping” is the process of executing code, one line at a time. Execute the line of code by pressing the F10 function key (or by using the debug toolbar). F10 is “step over”. In the image below, it would move the pointer from line 28, to line 30. If the current (pointed to) line of code has a method call, to a method that YOU wrote, you can jump to the beginning of that method. F11 is “step into”. In the image below, it would move the pointer from line 28 in the CustomersController.cs source code file, to line 41 in the Manager.cs source code file. While in the method, you can continue to F10 “step over”, or F11 “step into”, if appropriate. If/when you want to leave that method, you can Shift+F11 to “step out” of the method, and return to the line of code that was pointed to before entering the method. Here’s a full-screen image that summarizes the difference between “step into” and “step over”. Click to open the image full-size in a new tab/window. The following image shows the Locals window – lower-left – at the first breakpoint. Click to open the image full-size in a new tab/window. Assume that F10 (step over) was done. It moves the line pointer from line 43 to line 46. Notice the contents of the Locals window now. Click to open the image full-size in a new tab/window. Today’s code example – DebuggingIntro – is a copy of the “EditDelete” web app from last week. It has been changed, to introduce errors, and to get you started with a debugging experience. Your teacher will take you through the code example, in your hands-on computer-lab class/session. Example error conditions. Go through them in sequence. 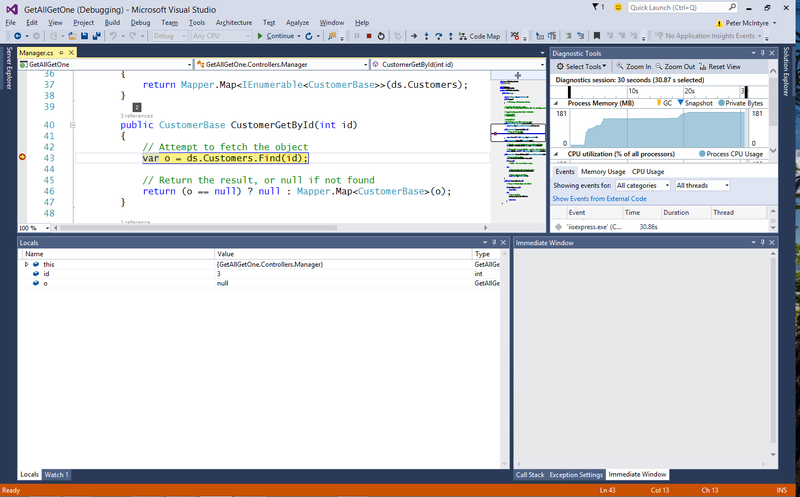 There are four MSDN documents that will help you with the debugging experience. Read and study them. Your professor will guide students as we get started on Assignment 4. Before you leave the room at the end of the time slot, give your completed in-class work report to your professor.